Believing children to be the most valuable natural resource on Earth and the best hope for the realization of our vision, WEM offers a fully prepared, authentic Montessori environment in which each child can grow in his or her own time and way toward their greatest potential; mentally, emotionally, socially, creatively and spiritually. Developing respect for self through academic excellence. This begins at WEM in an American Montessori Society (AMS) accredited school in a prepared Montessori classroom that lends itself to student success; a clean, organized environment that demonstrates beauty, order, sequence and predictability that includes the five fundamental areas of the Montessori early childhood level curriculum, and a full array of traditional Montessori materials and learning activities in the elementary and middle school classrooms. Global perspective by developing respect for others. WEM is fortunate to be centralized in an economically and culturally diverse community. Adhering to our mission to develop in each child a respect for others through an appreciation for the similarities as well as the differences that exist among the people of the world occurs naturally in the classroom setting. This is enriched by both the Montessori curriculum and the parent volunteers who share aspects of their cultures with the students. Respect for the environment through environmental awareness. The 5.0 acre Whole Earth campus provides a unique environment that offers student programs in alternative energy, stream-keeping, horticulture and permaculture. 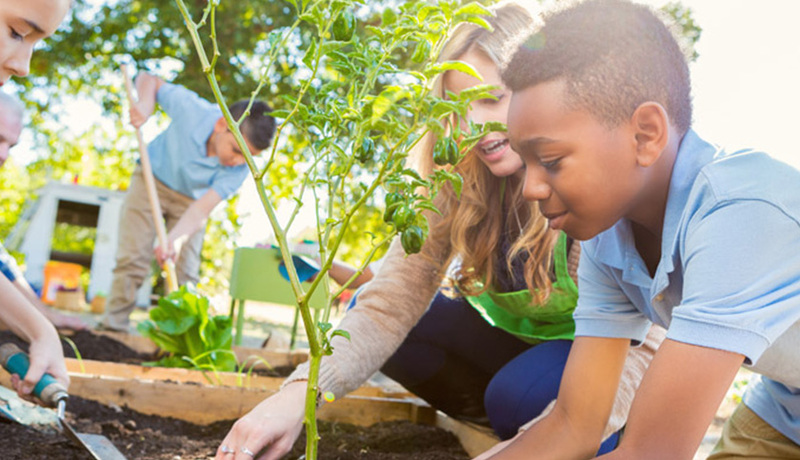 Establishing the goals of nurturing respect for self, others and the environment at the formation of the school in 1986, the search was on for a site that would allow students to develop an appreciation for the environment through a daily experience with nature. In 1989, the school moved to its present location in Bothell, a campus with a stream, wooded areas and garden.